A reputable and internationally recognized Non-Governmental Organization, Mission Africa has again, in her humanitarian disposition in collaboration with Ase Action Group, AAG, offered another free medical service to over 500 persons of the Ase community in Ndokwa East Local Government Area of Delta State, Nigeria, inaddition to that the NGO doled out over 250 free glasses to patients with Keratitis, Conjuctivities, Pterygium, Glaucoma, Presbyopia, and Refractive errors. Speaking during the outreach, the Executive Director of Mission Africa, Mrs. Ndudi Ikoro Chuku informed that Mission Africa which has always been known for her slogan, ” making impacts and changing lives, one village at a time,” added that, they are always delighted anytime there is an opportunity to serve. She posited that over 60 Volunteers were engaged for the outreach program. The Imo born philanthropist stated that their return to Ase was as a result of the discovery of their last year activity, which created a baseline to track the progress of Mission Africa in order, to find out how the health of the people have improved, she further revealed that, following last year activities, where alot of eye problems were recorded and glasses given out, they also wanted to find out if the problem has anything to do with the environment or the river, so as to call on the attention of the government. Mrs. Ndudi Chuku going down memory lane, revealed that the organization was formed in 2006 to tackle health ans social problems in Nigeria and has spread to nine different countries in Africa; Ghana, Gambia, Kenya, Sierra Leone, Togo, Rwanda, Tanzania, and Uganda. She further noted that, the organization has three core areas which are Education, Health Care and Poverty Alleviation. 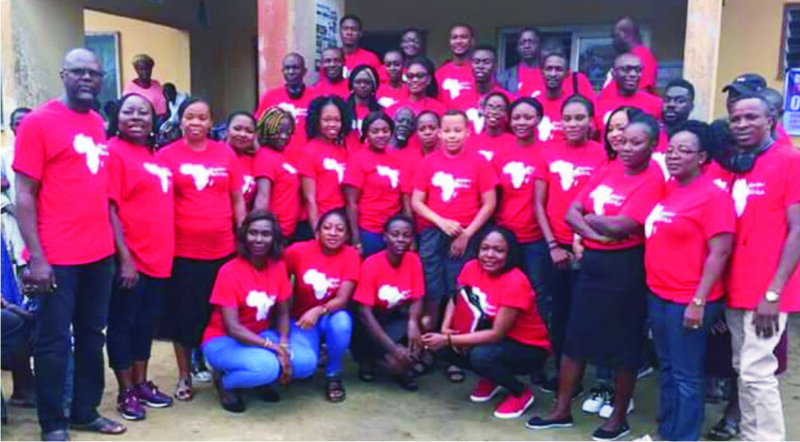 “While poverty alleviation is still at its growing stage where people are taught on how to empower themselves economically as micro loans are being given out, Mission Africa offers six years scholarship in addition to backpacks, reading materials and have over 50 students under their scheme”, she submitted. In an interview with the Leader of Ase Action Group, Mr. Nzefili Collins Osugo, who informed that the group, made of up good spirited sons and daughters who mean well for their community, said, there was need for a return adding that, he was satisfied with the huge turn-out and hoped for more subsequent projects. However, Mission Africa did conduct about six minor surgeries of damaged degenerated sebaceous cyst of the scalp, large lipoma of the lumbar area, giant inguinosaotal hernia, large direct inguinal hernia, excision of gaulion sebaceous cyst in middle finger and funginoscital hernia. A beneficiary, 80yrs old Pa. Gabby Ogbome and retired banker with the defunct Afribank who received free excision of gaulion sebaceous cyst in the middle finger, said it gave him alot of discomfort since the unusal growth grew on his fingers. The relieved Pa. Gabby thanked Mission Africa and prayed for more sponsors to be able to reach out more to the people. Highlights of event was the cultural reception given to Mission Africa with the Afukwe and Agueze Masquerade displays and various little girls dance group, who displayed their talents/skills and the coming together of the four clans who have been in conflict for 6 years was a significant milestone to the people of Ase. Ase, a Bini name which means “Goodness”, is located in the rain belt at the bank of the Ase River, which butts out from the great and vast River Niger at Asaba- Ase, is a part of Ndokwa East Local Government Area of Delta state, Nigeria.